Last week we talked about the word “ruin” and when I gave you examples offered by Vocabulary.com, I used the expression “when it comes to”. Today, let’s look at this phrase closely. When you say “when it comes to this or that”, it means “I don’t know about other things but when you speak about this or when the topic is about that”. For example, Mary has a sweet tooth. When it comes to sweets, Mary can’t control herself. David is a troublemaker. When it comes to trouble, David knows how to cause it. For your reference, “when it comes to” can go at the beginning of a sentence or at the end. 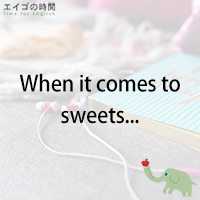 Instead of saying “When it comes to sweets, Mary can’t control herself”, you can also say “Mary can’t control herself, when it comes to sweets”. When it comes to sweets, I can’t control myself.